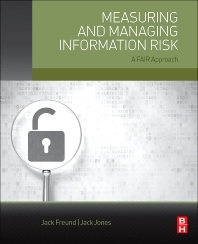 Using the factor analysis of information risk (FAIR) methodology developed over ten years and adopted by corporations worldwide, Measuring and Managing Information Risk provides a proven and credible framework for understanding, measuring, and analyzing information risk of any size or complexity. Intended for organizations that need to either build a risk management program from the ground up or strengthen an existing one, this book provides a unique and fresh perspective on how to do a basic quantitative risk analysis. Covering such key areas as risk theory, risk calculation, scenario modeling, and communicating risk within the organization, Measuring and Managing Information Risk helps managers make better business decisions by understanding their organizational risk. Uses factor analysis of information risk (FAIR) as a methodology for measuring and managing risk in any organization. Carefully balances theory with practical applicability and relevant stories of successful implementation. Includes examples from a wide variety of businesses and situations presented in an accessible writing style. Security and risk executives, directors, managers, and analysts; IT risk managers; information security professionals; students of OpenGroup’s FAIR Certified Risk Analyst Certification Exam; graduate business or IT students taking courses in risk management and IT security. Dr. Jack Freund is an expert in IT risk management specializing in analyzing and communicating complex IT risk scenarios in plain language to business executives. Jack has been conducting quantitative information risk modeling since 2007. He currently leads a team of risk analysts at TIAA-CREF. Jack has over 15 years in IT and technology consulting for organizations such as Nationwide Insurance, CVS/Caremark, Lucent Technologies, Sony Ericsson, AEP, Wendy’s International, and The State of Ohio. He holds a BS in CIS, master's in telecommunication and project management, a PhD in information systems, and the CISSP, CISA, CISM, CRISC, CIPP, and PMP certifications. Jack is a visiting professor at DeVry University and a senior member of the ISSA, IEEE, and ACM. Jack chairs a CRISC subcommittee for ISACA and has participated as a member of the Open Group’s risk analyst certification committee. Jack’s writings have appeared in the ISSA Journal, Bell Labs Technical Journal, Columbus CEO magazine, and he currently writes a risk column for @ISACA. You can follow all Jack’s work and writings at riskdr.com. Jack Jones, CISM, CISA, CRISC, CISSP, has been employed in technology for the past thirty years, and has specialized in information security and risk management for twenty-four years. During this time, he’s worked in the United States military, government intelligence, consulting, as well as the financial and insurance industries. Jack has over nine years of experience as a CISO with three different companies, with five of those years at a Fortune 100 financial services company. His work there was recognized in 2006 when he received the 2006 ISSA Excellence in the Field of Security Practices award at that year’s RSA conference. In 2007, he was selected as a finalist for the Information Security Executive of the Year, Central United States, and in 2012 was honored with the CSO Compass award for leadership in risk management. He is also the author and creator of the Factor Analysis of Information Risk (FAIR) framework. Currently, Jack is co-founder and president of CXOWARE, Inc. Co-founder and president of CXOWARE, Inc.